In today world of technology, every business owner knows the importance of grabbing the attention of potential customers with the help of websites or other online tools of technology because they know it very well that without these tools they may go invisible for their clients and this invisibility could hit their market value. Now the customers want to access the services through their Desktop, tablet or mobile phone so they need your presence on all available devices. It could be hard for many people to differentiate between the separate mobile website or responsive website design, and could also be difficult to choose between them for some specific business. There is a lot of difference between these two tools that need to be clear before taking the final decision. 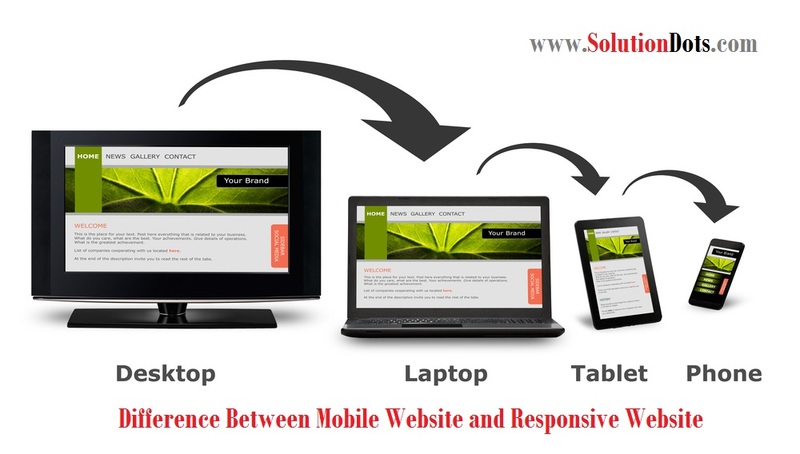 So today we’ll focus on the difference between Mobile Website and Responsive website. These websites lead towards the good user experience because the mobile optimized websites could be accessed easily all content could be seen or read easily. Mobile optimized websites increase the downloading and loading speed. Such websites improve the search ranking on different search engines. They could be accessed anywhere and anytime, this connectivity will increase the consumer's confidence and trust. It is a cost-effective technique to available for users and to stand out among the competitors. If you have a responsive website design for your business it simply means that Google is going to rank it higher because google understands the terms according to the user-friendliness. Responsive website design simply means that business is taking care of user’s need and requirements, therefore, Google rank it higher. Google is ranking the website higher means business is going to get traffic of their potential customers and with the help of this traffic. It will improve the sales and revenue of the business because customers can easily and comfortably get access to the complete information of website as well as business. Responsive website design will improve the user’s experience because they could easily get the information anywhere and anytime. This responsive website design is going to save the time that spends on the management of the website as well as the time of the user. You just need to update and track one same website for all analytics and could get the consolidated report of user’s journey. Responsive website design is a dynamic mobile friendly website that is easy to build as well as maintain with the time-saving approach. In mobile optimized website design, dual content is required one for the desktop version while other is for mobile version because similar content could affect the Google ranking. Responsive website design is a bit expensive from the mobile optimized website but more efficient in working. Both mobile optimized website of responsive website design has their own pros and cons now it depends on the business owner to whom they prefer.